•	Mobile customers looking to take advantage of deals on cellular service will want to consider purchasing plans directly through Basic Talk. This company offers discounted cellular service on a regular basis, with other deals and coupons available on the home page. •	Email offers, including discount codes on entire orders and free shipping coupons for mobile devices, are going to be sent out to email newsletter subscribers on a routine basis. Customers visiting the Basic Talk website will have the chance to sign up for the free email newsletter program offered by this company right after they land on the homepage. •	Follow this company on social media to learn about social only coupon codes not available elsewhere. 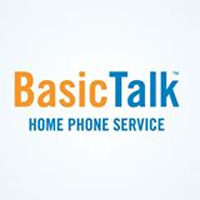 BasicTalk represents a phone service with a variety of features and potential benefits. The way BasicTalk works is fairly straightforward. Utilizing your high-speed internet connection, you will have access to unlimited calling for only $9.99 a month. There are a number of basic features that are included, such as caller ID, voicemail, call waiting, 911, 411, anonymous call blocking, and much more. All you have to do is connect their device to your router, and then connect the phone to their device. You can keep your current phone number. It is also worth noting that through this phone service company, you will not be required to sign an annual contract. For most up to date offers check out Basic Talk on Facebook and Twitter or contact Basic Talk Support for any questions.